Dolphins, with their hairless, muscular, torpedo-like bodies, almost look like they come from a different planet. In my experience, people prefer animals that they can relate to, and at first glance, dolphins definitely seem as far from a human as any living creature could get. We live on land, they live in water. We have arms and legs, they have flippers and tails. We talk, they click. Because of these differences, some may not recognize all the things we share with our aquatic friends. Beyond a dolphins’ intelligence, social units, and familial bonds, living in a dolphin body isn’t actually that different from living in a human one. 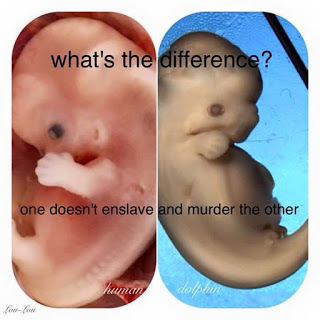 As it turns out, dolphins and humans fetuses look pretty similar. When in the uterus, human fetuses briefly have an external tail, while dolphin fetuses show small hind protrusions. These protrusions are thought to be leftover genetic material from our respective ancestors, and provide clues to a time where “humans” had tails, and “dolphins” walked on four legs as land mammals. Though these growths usually disappear before birth, a mysterious, and seemingly useless, pelvic bone is still found in most cetaceans. In humans, the pelvic bone has a number of functions, such as bearing the weight of the upper body and regulating posture when sitting, walking, and standing. In dolphins, however, the pelvis is almost entirely useless, save for a new theory regarding sexual selection. Again, this bone is a reminder of a time when dolphins were terrestrial mammals like us. To bring the comparison full circle, a similar leftover bone is found in humans: the tailbone. The anatomical similarities between humans and dolphins don’t end there. Despite the radically different appearances between human arms and dolphin flippers, our limbs are remarkably similar in bone structure. 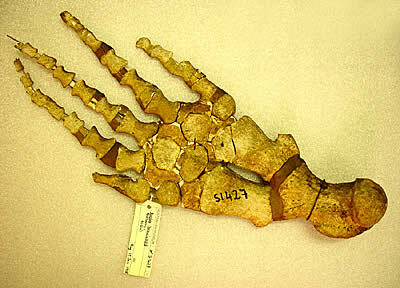 Inside of their flippers, dolphins have five phalanges, or finger bones. Along with the five phalanges, dolphins also have carpals, ulna, and radius and humerus bone fragments, just like humans. A quick google search of “dolphin flipper bones” reveals that our hands and dolphin flippers are actually far more similar than they are different. Another surprising shared anatomical trait between humans and dolphins is our nose. Wondering why you’ve never noticed a dolphin’s nose before? It turns out, you have: dolphin noses are actually their blowholes. Like humans, dolphin’s blowholes/noses are divided into two nostrils. Though human noses are situated on the front of the face, the dolphin blowhole migrated upwards over the course of their evolutionary history for more efficient breaths between dives. Along with fingers, nostrils, and pelvic bones, because dolphins are mammals, they share several other features with us. Like all mammals, dolphins are warm blooded, birth live young, nourish their young with breastmilk, and have hair (though only for a couple of weeks after they are born). Though dolphins and humans couldn’t look more different from the outside, it would seem that our bodies and minds actually have quite a lot in common. After all, as we humans like to say, it’s what’s on inside that really counts. Beyond dolphins’ intelligence, social units, & familial bonds, living in a dolphin body isn’t that different from living in a human one. A mysterious pelvic bone is still found in most cetaceans. A similar leftover bone is found in humans: the tailbone.